It could often be said to be the result of one particularly inspirational teacher, or even a single figure who becomes an inspiration to others; the latter certainly explains the immense profusion of young Chinese learning the piano, inspired by the example of Lang Lang. The fact is, though, that certain nationalities have a disproportionate representation at international level in certain musical disciplines. When the Malaysian Philharmonic Orchestra was set up, with a totally clean sheet and the pick of the best from all over the world, it seemed that the brass was dominated by North Americans (which is still very much the case with the Singapore Symphony Orchestra). Perhaps it was geographical location and regional connections which meant most of the woodwind section were Australians. But other factors saw many string players coming from Russia and Eastern Europe, notably Hungary. ﻿﻿﻿﻿﻿﻿﻿﻿Whatever the reason, Great Britain produces the very finest choirs and orchestras in the world (I accept no dispute over the choirs - I am right! - and those who query my statement about orchestras I can only counter with sets of initials - BBCSO, LSO, LPO), France has historically produced the greatest organists in the world, and the USA reigns supreme in the field of jazz singers. We could look back into history and identify Austria as producing a disproportionate number of great composers and Italy a disproportionate number of great opera singers. 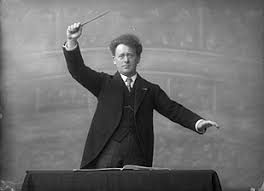 And for over a century, some of the finest conductors in the world have come from The Netherlands. Eduard van Beinum, Willem Mengelberg, Bernard Haitink, Edo de Waart and Frans Brüggen will be known to all, while very much a rising star on the scene is another Dutchman, Jaap van Zweden, whose work with the Hong Kong Philharmonic has shown him to be a true star, even if (according to my colleagues) he has yet really to make his mark with the New York Philharmonic. And there's another. ﻿﻿﻿﻿I well recall an occasion in early 1997 when I was in for a lunchtime meeting in the old Petronas HQ at Dayabumi in Kuala Lumpur. Ian Smallbone, who was then heading up a small office of IMG Artists working with Petronas to set up the Malaysian Philharmonic Orchestra, greeted me excitedly; "We've got our conductor!" he beamed, but refused to tell me more until we were at lunch. This was a great celebration since not only was the choice of conductor pivotal to the success of this new orchestra, but they had been searching high and low for the right man. I could barely contain my own excitement, but when Ian blurted out the name at lunch - Kees Bakels - my reaction was, who? I had even forgotten the name by the time I got home, and had to phone the office to get them to remind me. Well, the rest is history, and while the name of Kees Bakels may still not command the respectful recognition of thousands of music lovers worldwide, in my book, and in the books of many who witnessed the miracle he performed with the Malaysian Philharmonic, Bakels is every bit as fine (I would say finer) than any of his more famous compatriots. I cannot speak of Mengelberg or van Beinum, whom I only heard on record (and a recording is no reliable indicator of the ability of a musician on a live stage) but Bakels for me gives Haitink more than a run for his money , we can't compare him with the more specialist Brüggen, but give me a Bakels performance over a de Waart or a van Zweden anyday. And my opinion is not merely based on the incredible work he did in Malaysia, but on hearing Bakels with other orchestras, notably in the UK at Bournemouth and Leeds and, just last week, in Singapore with the usually frayed Singapore Symphony Orchestra. Here's my Straits Times review. 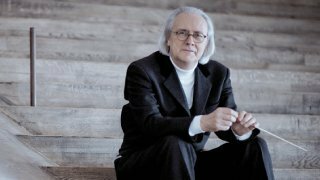 More than a dozen years have passed since Dutchman Kees Bakels left the Malaysian Philharmonic Orchestra which he founded in 1998 and took, against all the odds, to the very peak of international excellence. So it was good to welcome him back to South East Asia. The big question was, could he work his magic on the Singapore Symphony Orchestra. Rossini’s Overture to Cinderella opened this programme of Familiar Favourites – none of which seemed at all familiar to many in the audience. Nobody does a Rossini crescendo quite like Kees Bakels. He starts it on his knees, hardly moving his upper body, and then draws himself up to his full height opening his arms wide as he does so. The response from the SSO was spell-binding. But that was only the tiniest of tasters. The true magic came with the second half. Familiar tunes from Tchaikovsky’s ballet score, Sleeping Beauty, occasionally pop up in concert programmes, but here we had all of the Prologue as well as a great chunk of the first act - as Bakels told the audience after their enthusiastic applause had interrupted the performance after one brilliantly measured climax, they could have had acts two and three as well, only he had left them back home. 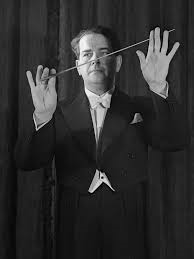 With fluttering hand gestures which you would never find in any tutor on conducting, and often not using his hands at all, merely directing the orchestra with a shimmy of the hips or a raised eyebrow, Bakels conjured up playing from the SSO which almost defied belief. Exhibiting a precision and clarity of detail, and producing a meatiness of string tone one did not think possible from this orchestra, they gave a performance as scintillating and exhilarating as it was joyous and foot-tapping. Here was a brilliant demonstration of a master conductor at work and an orchestra raising its game beyond all expectations. Between these ravishing displays of orchestral brilliance, came an equally impressive display of violin virtuosity. Richard Lin’s biography tells us that he has been busily amassing "a startling collection of top prizes at major international competitions". And it showed in a performance of the Korngold Violin Concerto which seemed more concerned with judge-impressing technical prowess than interpretative insight or real musical involvement. Unquestionably Lin possesses unbridled virtuosity, but it was left to Bakels and the SSO to create the richly romantic atmosphere which lies at the heart of Korngold’s Concerto. Managing to avoid making the work sound like the hotchpotch of Hollywood movie themes of the 1930s and 40s which it really is, Bakels pushed it all along purposefully, letting the big tunes soar and never allowing emotional self-indulgence to get in the way of Lin’s glittering, crowd-pleasing virtuosity.